I do strive to be accurate in my work, and when I’m not, I want to be the first to admit I was wrong. In my current End of Day/ Week Report I made an error when discussing the hammer candlestick on TLT, and didn't realize it until I was laying in bed! I mentioned that a reversal of that hammer would conflict with all the other hammers found in equities, and that was incorrect. It would actually support the direction of movement of the other hammers as bond prices normally rise when stocks decline which is what those hammers are saying. The End of Day post regarding TLT has been updated. Evidently the math isn’t working out so well in California. This is a situation that will need Federal help. In other words, Californians, like all Americans, will have to be taxed more so that they can bail themselves out. John Chiang announces that his office will suspend $3.7 billion in payments owed to Californians starting Feb. 1, as a result of the state's cash crisis. Student grants are also affected. Reporting from Sacramento -- State Controller John Chiang announced today that his office would suspend tax refunds, welfare checks, student grants and other payments owed to Californians starting Feb. 1, as a result of the state's cash crisis. Chiang said he had no choice but to stop making some $3.7 billion in payments in the absence of action by the governor and lawmakers to close the state's nearly $42-billion budget deficit. More than half of those payments are tax refunds. The controller said the suspended payments could be rolled into IOUs if California still lacked sufficient cash to pay its bills come March or April. "I take this action with great reluctance," Chiang said at a news conference in his office. But he said that without action to close the deficit, "there is no way to make it through February unscathed." The payments to be frozen include nearly $2 billion in tax refunds; $300 million in cash grants for needy families and the aged, blind and disabled; and $13 million in grants for college students. Bank Failure Friday - Part II... This one hits closer to home. National Commerce, Clark County Bank Seized by U.S.
Bank of Clark County in Vancouver, Washington, was also closed today by authorities. The FDIC was also named the receiver for Clark County, which had $446.5 million in assets and $366.5 million in deposits. Umpqua Bank of Roseburg, Oregon, is assuming Clark County’s insured deposits. Clark County is the first Washington bank to fail since Seattle’s Emerald City Bank went under in 1993. Washington Mutual Inc., formerly the biggest savings and loan, was seized Sept. 25 and its branch network sold to JPMorgan Chase & Co. after customers drained $16.7 billion in deposits in less than two weeks. Wachovia Corp., the sixth- biggest bank, was pushed by regulators into a sale and snapped up by Wells Fargo & Co. for $12.7 billion. Vancouver, Washington is just across the Columbia River north of Portland, Oregon. While it wasn’t right down the street, it’s hitting close to home. 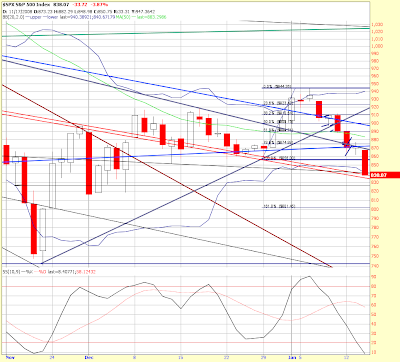 Well, I would summarize that close as somewhat bullish on a daily basis, but much less than bullish on the weekly. Huge down week on the XLF, and for the transports. It seems that the gloss is coming off the financials once again. For the day, the DOW finished up 68 points (.8%), the S&P was up .75%, the NDX gained 1.24%, and the small caps in the RUT gained .8%. Notables are the XLF which lost 3%, BAC down 13.7%, C down another 8.6%, JPM down 6.2%, WFC down 7.3%, OPY was UP 9%; and outside the financials, gold rose $23, IYR and REITS rose 3.7%, while the VIX was down 9.6%. Market internals were mostly positive with advancing issues nearly 2 to 1 on the positive. 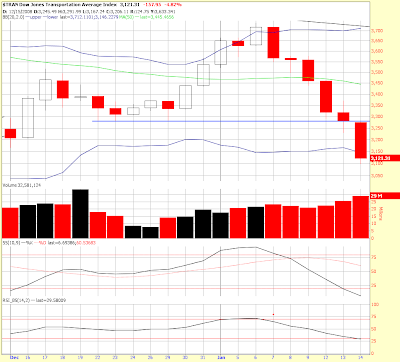 New 52 week lows, however, are still bearish. Bank of America, for example, set a new 14 year low today. So, fundamentally I see a corrupt and immoral financial system showing its true colors again – in other words, it’s ugly, and the underlying math is relentless no matter how hard they try to hide it. The math just keeps coming back to haunt. I’ll say it again – until the debt clears, as in gone, the market cannot fully recover. With all attempts to hide the bad math, the actual underlying math only gets worse. From a technical perspective I see a lot of mixed indicators, a lot of strange candlesticks (possibly opex weirdness), and a headache from staring at the charts all week! Seriously, there’s a lot going on here, so I’m going to throw a lot of charts up. Those not into the technicals… well, I can see your eyes rolling back already, but those who depend on them will see a lot happening at least in the short term, so bear with me. While I’m thinking of it, I want to mention that I’m working on upgrading my site to one that lands you on a home page (same color scheme) with headlines and is broken into sections – one of those sections will be for market updates, another for technical articles, another for general articles and economic stories, and another for my personal full length articles. I think that will be nice because you can skip the technical stuff and market updates if you’re only here for the macro picture, and visa versa. The revised site will have some other advantages, such as when you click on an article or update you will be taken to its own page that will have the dark background as a frame, but will have a white background with black lettering to make reading easier on the eyes. I don’t like too much light and some people don’t like reading the white letters, so I think this will be good for everyone. look at Bloomberg.com to see how they deal with it – my look though, will not be anywhere near as busy as that! Another advantage of that layout is that page loading will be more quick because you won’t be pulling up my last 10 posts with all the pictures and videos. It’s still a little way out there, and I’ll be working on it this weekend, so if you have comments or suggestions on what you’d like to see, please leave a comment here or email me, thanks. Back to the technical landscape… I’m sure you will be hearing all the pumpers (who earn a living directly or indirectly from selling you something) talk about how we didn’t break down to new lower lows and how that’s a positive thing. This is just plain old silliness, just like the B.S. I was hearing on CNBS today… things like oil collapsing in price is a good thing… CPI being negative is only about energy and it doesn’t show deflation! Yeah, okay, sold to them! They do not understand what’s happening, they certainly didn’t see it coming, and remember who they work for! Here come the charts, let’s start by looking at the ugly stepsister, the financials! 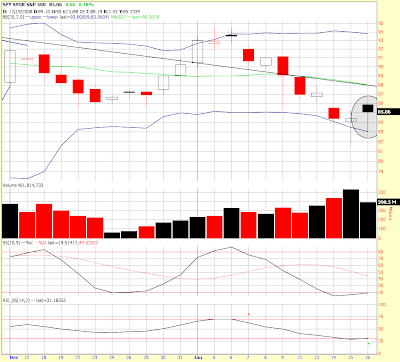 Here’s a three month weekly XLF chart. 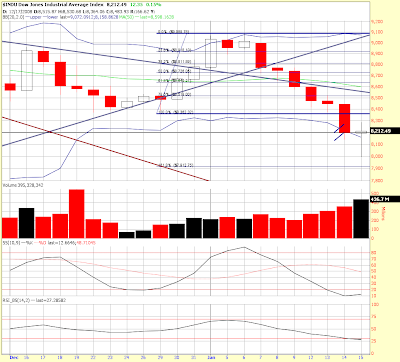 It’s bearish looking as heck, no other way to read that. 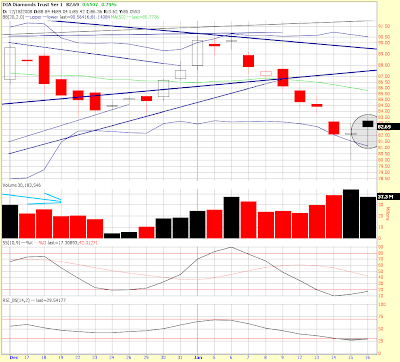 Note that as you look left to right you see decreasing volume as it went up, and now increasing volume as it goes down. Look at the weekly stochastic and RSI, they are both turning back down and the stochastic is in danger of moving to a sell pretty soon if the selling continues. I want to point out that the P&F chart for the XLF has a target of $5.50! Financials are clearly still an anchor around the neck of the entire market. A sustainable rally is not possible without their participation. How about the Q’s? 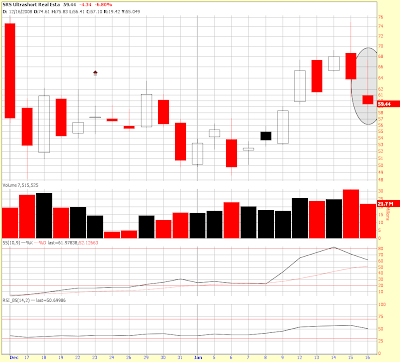 Same thing, big old black hammer, falling volume. It’s a mystery to me… the day felt bullish, but strange as the financials were falling apart while the rest of the market tried to rebound. Does that sound familiar? Isn’t that how the prior sell offs got put into motion, with the financials leading the entire market down? So, there’s weirdness underlying the financials, the rest of the stocks, and even the bond market. It “feels” strange to me, like we’re at a turning point that may not be what most people think. Those hammers are talking, are we listening? Next week is Obama’s big week. Do the masses feel frightened? Do they feel full of HOPE, or are they figuring out that he’s adding to the bad math, possibly setting the market up to disappoint? Frankly, I think that people across the entire globe are getting a funny feeling in the pit of their gut driven by the realization of what a financial mess the banks are really in. You might say that the sentiment is shifting, like it is the end of the innocence. XLF has been the key all day. 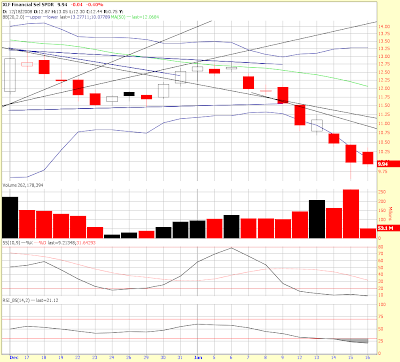 It bounced off $9.24 and has been rebounding since, now approaching $9.90 which is still at a 2.2% loss for the day. 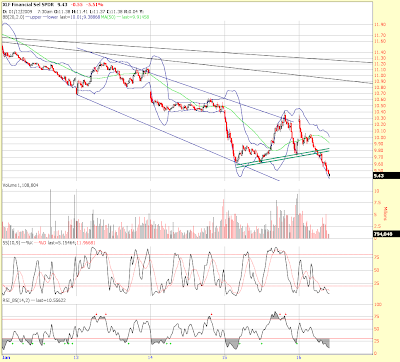 I have some indicators saying sell into the close, but others are more bullish, so I’m flat once again. 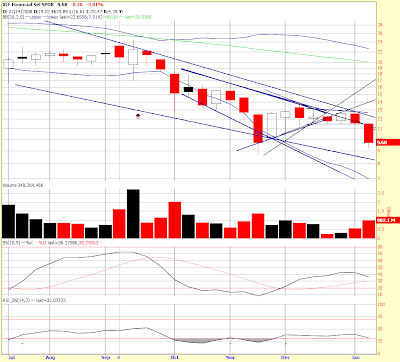 Will have charts after the close, it’ll be interesting to see what the candlesticks look like for the day. 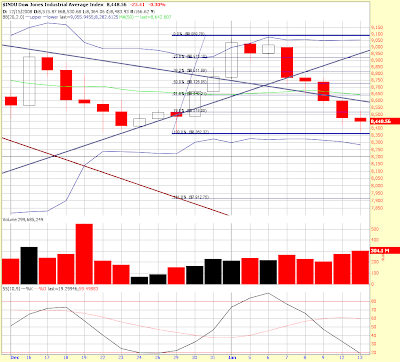 The weekly candles look more bullish after this 200 point run off the bottom, so we’ll take a look at those too. Remember, a long weekend is coming… more after the close. 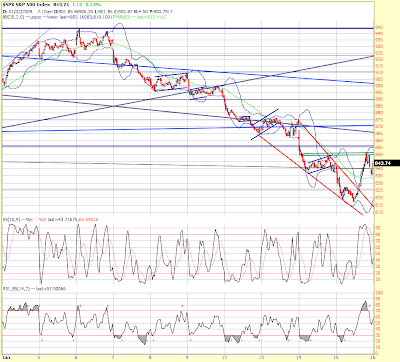 I got more short on the break of that neckline and then again got more short when the SPX broke it's uptrend line. Watching closely, I think the XLF is obviously the key to today. I note that the VIX is coming back up and so are bonds which have jumped back up out of their channels - glad I didn't jump on that! The hits just keep on coming, one of these days the rule of law will prevail, but the lawlessness for now just seems to be getting worse. And the market doesn’t care at this point and is higher, continuing its technical bounce. Right now the DOW is up nearly a hundred points and the S&P is up 10. Data out this morning shows the CPI fell .7%, again energy being cited, but the deflationary forces are taking hold. Investors and institutions across the world repatriated funds in November, leading to a net outflow of $21.7 billion in long-term U.S. securities. Foreign accounts sold a net $56.0 billion of U.S. assets in the month while U.S. accounts sold a net $34.3 billion of foreign assets. Of the $56.0 billion in foreign outflow, official institutions sold a net $37.1 billion of U.S. assets with private investors selling $18.9 billion. Foreigners were once again heavy sellers of U.S. agency debt and were also heavy sellers in November of corporate bonds. That is showing investors do not like what they see happening in the treasury complex, and guess what? 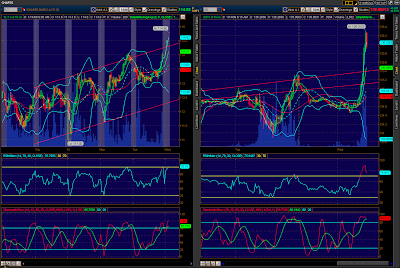 Treasuries are way off this morning, TLT and /ZB have returned to their respective channels. I may re-enter my bond trade with a small position just to see what happens (haven’t yet). 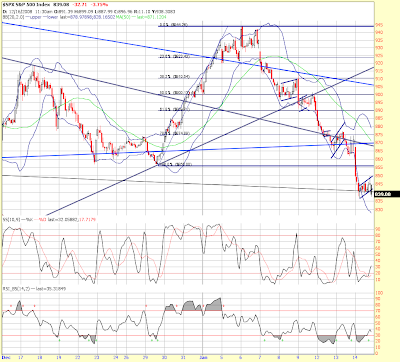 I think Mish and others who think bonds will stay high in price for a long time may be incorrect. If there’s no rule of law in the U.S. foreign investors will exit and we already know some of the big players are doing the same. The XLF is barely positive and is still weighing on the market, another reason that I am skittish about holding long here. For the market to rally, financials must go along for the ride. In any event, I don’t like what’s happening with the bailouts, etc. and I think the bond market doesn’t like it either. It’s unorganized, it’s lawless, and until the looting of the taxpayer stops, the markets have no chance. 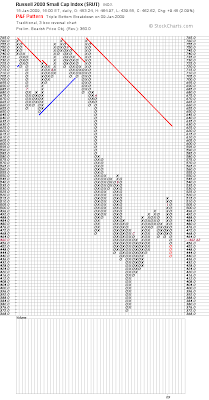 PS – I trust this move so little that I just exited my long positions… sorry it took so long to get this out. What Citi is doing here is a just a plain old fashioned corporate shell game. Look over here, NO – over here – Which shell is the crap under? This, under any sense of decency, is just WRONG. It is also illegal to create a shell company for the purpose of hiding assets. Yet, this is just another example of our Government allowing the BS and not holding these companies to the rule of law. When the rule of law is not enforced, lawlessness follows. In this case, all these large banks comprise the Federal Banking System, they effectively ARE THE FED. And that’s why the control of the central banking system must be returned to the people, and I believe that will ultimately be a fallout and consequence of their actions. Look at some other countries around the world, such as Ireland. They are nationalizing their banks saying that if they must use taxpayer money to bail them out then ownership of those companies belongs to the people. This should always be the case, in my judgment, private individuals should not profit from the manufacture and distribution of a money system that rightly belongs to the people in the first place! Results come in far worse than analysts were anticipating; banking giant will realign into two units, ending its so-called 'universal banking' business model. NEW YORK (CNNMoney.com) -- Citigroup reported a much bigger-than-expected $8.3 billion quarterly loss Friday, while the beleaguered bank also revealed plans to split up into two businesses, effectively bringing an end to the company's "financial supermarket" model. 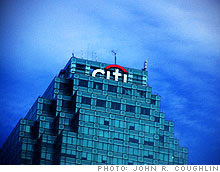 Under the new arrangement, Citigroup would split into two units: Citicorp and Citi Holdings. Citicorp would house, among other things, the company's private and investment bank as well as its credit card and consumer banking business. Citi Holdings would incorporate its so-called non-core businesses, including its Smith Barney brokerage and a pool of troubled assets that have plagued the firm for more than a year. CEO Vikram Pandit said the difficult economic and market environment for both Citigroup and the broader banking sector forced the company's hand, adding that the move will help simplify the organization and help better serve both clients and customers. "The realignment will preserve what makes Citi unique -- its global, universal banking footprint," he said in a statement. "We will continue to move aggressively to get Citi back on the right track and return it to a position of sustainable financial success." Citigroup (C, Fortune 500) stock rose nearly 6% in pre-market trading following the release. But shares of the battered bank have plunged 43% so far this week due to concerns about its future. Citigroup, which ranks as one of the world's biggest banks by assets, said it would work to implement the changes as quickly as possible, with the new structure reflected in its reporting by the second quarter of this year. Analysts have speculated in recent months that the company may look to sell additional divisions in an effort to raise cash. During a conference call Friday morning, Pandit said Citigroup would continue to look at all options for its Citi Holdings businesses, but that they were not in a rush to sell some of those units. The broader restructuring move, however, will effectively reverse the 1998 merger between Citicorp and Travelers Group overseen by then-CEO Sanford Weill. That deal created the modern-day Citigroup and its so-called "universal bank" business model, which aimed to offer clients and customers a smorgasbord of financial services. For years, both shareholders and analysts have clamored for Citigroup to abandon this business model because they believed it did not work. The latest results from Citi seem to prove them right. Freddie, private banks over a cliff? Unless you follow the banking industry closely, you probably haven't heard of the Federal Home Loan Banks. But the FHLBs are vitally important as a source of funding for U.S. banks both large and small. There are 12 of them spread around the country — in Atlanta, Boston, Chicago, Cincinnati, Dallas, Des Moines, Indianapolis, New York, Pittsburgh, San Francisco, Seattle, and Topeka. FHLBs sell debt into the capital markets to raise money, using their AAA ratings to borrow cheaply. They use that money to make advances to banks that are members of the system and take collateral in exchange — often mortgages or mortgage-backed securities. The banks use the money they get from the FHLB, along with cash raised elsewhere from their own debt sales and depositors, to make loans. 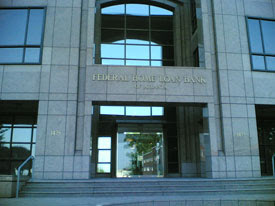 The banks are required to own stock in the FHLBs, and that stock helps capitalize the regional FHLBs. The FHLBs own billions and billions of dollars worth of mortgage backed securities. Those securities have plunged in value. So just like their banking customers, FHLBs are facing potentially huge write-downs on their portfolios. They may also be losing money on derivatives they employ. And that's what is stressing the system. The Seattle FHLB just warned that it may miss one of its capital targets. It may be barred from paying dividends on the stock member banks hold in it, potentially impacting those institutions counting on the money. The San Francisco FHLB also said earlier this month that it was facing impairment charges, and that it wouldn't pay a fourth-quarter dividend as a result. Moody's recently warned that eight out of the 12 FHLBs could ultimately face capital problems thanks to losses on their $76 billion of mortgage securities not backed by Fannie Mae and Freddie Mac. Now here's where it gets really interesting: While many investors have never heard of the FHLBs, they collectively have roughly $1.25 trillion — with a "T" — in debt outstanding. That makes them the biggest borrowers in the U.S.— behind the federal government! If you thought it was expensive to bail out Fannie Mae and Freddie Mac (The Treasury has pledged to inject up to $200 billion in capital into the two of them), just you wait. Should the FHLBs need a bailout, there's no telling how much it will cost! In other words, we're looking into the maw of yet another gigantic black hole! Jan. 16 (Bloomberg) -- The U.S. government agreed to invest $20 billion more in Bank of America Corp. and backstop $118 billion of its assets to help the lender absorb Merrill Lynch & Co. and prevent the financial crisis from deepening. The government agreed to the rescue “as part of its commitment to support financial market stability,” the Treasury Department, Federal Reserve and Federal Deposit Insurance Corp. said today in a e-mailed joint statement. Hours earlier, the U.S. Senate voted to allow the release of $350 billion in financial rescue funds, the second half of the $700 billion Troubled Asset Relief Program enacted Oct. 3 by President George W. Bush. The U.S. already had injected $15 billion into Bank of America, the country’s biggest lender, and another $10 billion to Merrill to bolster the combined company against the global credit crunch. Bank of America will absorb the first $10 billion of losses in the pool, of which the “large majority” of assets were assumed by the company in the Merrill purchase, the government said. The Treasury and FDIC will share the next $10 billion of losses. The Fed will backstop assets with a loan after the government’s first $10 billion in losses, the agencies said. The asset pool includes cash assets with a current book value of as much as $37 billion and derivatives with maximum potential future losses of as much as $81 billion, according to the term sheet provided by the government. Separately, the FDIC said it plans to propose changing its bond-guarantee program for banks to cover debt as long as 10 years, from the current three-year maturity. The FDIC will soon propose rule changes to the Temporary Liquidity Guarantee Program, today’s statement said. “The U.S. government will continue to use all of our resources to preserve the strength of our banking institutions and promote the process of repair and recovery and to manage risks,” the joint statement said. Shares of Bank of America plunged 18 percent yesterday, sliding to $1.88 to $8.32 in New York Stock Exchange composite trading after hitting $7.35, its lowest level since February 1991. The bank moved up its fourth-quarter report to today at 7 a.m. New York time. I have read every book that Harry Dent has written and even quote some of his work in my book. Yes, he is the one who famously predicted a DOW in the 30,000+ range and he was obviously not correct. HOWEVER, he is a true demographic expert, whose work I admire – he has done a lot of research into the effects of demographics, the effects of the Baby Boom generation, world wide demographics, and real estate trends. He also has studied cycles, and especially S-curves and technology cycles so he has a good foundation. I think he is NOT, however, an Elliott Wave disciple, nor does he understand waves the way that Martin Armstrong does. At any rate, here’s his latest thinking for what it’s worth… I think he’ll be a lot closer on this call than the vast majority of investors. Not sure about his timing of the “reprieve” I think we may be there now, but I’m open to his timing comments. I think we’ve already entered a depression, but just as most of the “experts” were a year late in recognizing a recession, most will be a year late in recognizing the depression. Despite what looks like a reversal day, this morning’s action produced new LOWER targets on most of the indices and the NDX broke down enough to trigger a bearish target as well. Once these targets are triggered, the market may bounce, but they have to now break out higher to produce bullish targets again. Okay that was a wild close! The U.S. Airways crash in New York sparked some selling which may have been a knee jerk reaction (thinking possible terrorism?). Once it turned out that everyone evacuated safely and that it was likely due to geese, the market picked right back up into a more bullish close and I got a little bit long biased for tomorrow as that’s what the close was saying. Miraculous that everyone survived the ditching, terrific job on the part of the crew as well as the boats on the Hudson river to get everyone out! Way to go! Having geese take out both engines on takeoff is obviously a very dangerous thing. It seems to me that the pilots kept their cool and kept the airframe under control to guide it to a water landing in an otherwise very populated area. Then the flight attendants and passengers did a good job getting everyone out once they were in the water… that’s why you don’t want to always choose who you fly with based solely on cost! Back to stocks… For the day the DOW managed to close UP 12 points, which wasn’t much of a gain, but it was a big reversal. The S&P closed up .13%, the NDX was up strongly with a 1.7% gain, the RUT led the way up with a plus 2.1% showing. 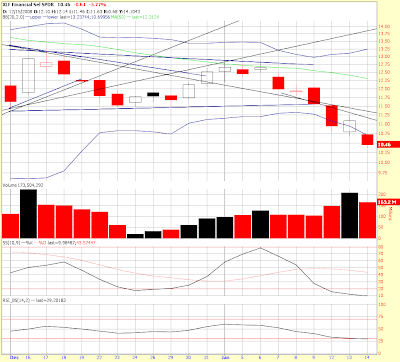 Notable is the XLF which lost 4.6% and split from IYR today which closed UP 2.9%. The VIX, which was up 10% early in the day closed up 3.8%. Bonds closed mixed on the day, still above the channel they had been in. It’s the same basic picture on the SPX daily, a doji, but the NDX and RUT candles look stronger, the NDX was darn near engulfing, but not quite. From an Elliott Wave perspective it looks like we either just began wave 2 up of 5 down, or we may have just began wave ‘c’ up of the larger wave ‘B’. The break higher out of that ending diagonal looked impulsive and is steep like what you would expect for either of those two possibilities. Another news item today is that the House Democrats offered up an $825 billion stimulus package that would include money for the states and tax cuts. Lovely. Intel reported a 90% decline in earnings after the bell which met their already lowered expectations and that has the NDX futures up a little. RIMM was a big winner today, too, up 9.2% on the day. 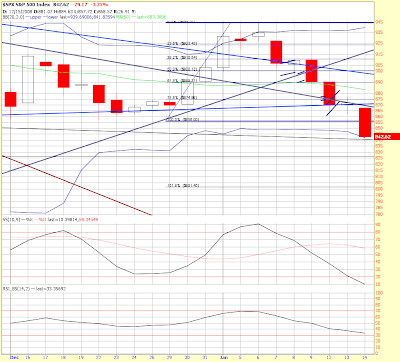 So, overall it looks like a possible reversal day. 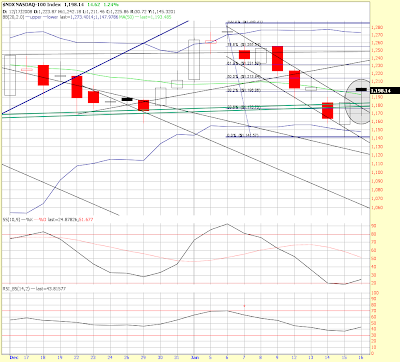 We’ll need follow through tomorrow which is Opex and then we can start to look at how long the rally could last or go. This has the potential to be a good sized retrace as it’s most likely the start of either wave 2 or wave ‘c’… either of which could run. Of course I caveat that with the fact that it’s a technical rally if it goes, the fundamentals have NOT changed and this is still very much a bear market. Consumer sentiment comes out tomorrow morning and now that we’re into earnings season the possibilities of a tape bomb can come at any time. Did you see that AIG is paying out more than $150 million more in bonuses to retain their “top people?” That would be our money, yours and mine rewarding their risk taking and bad behavior! Isn’t that grand? Let me bounce this idea off everyone to see if the idea sticks… A trading friend and I spend the day chatting on a very fast and cool instant messenger service that allows us to communicate and trade charts in real time – boy is that ever helpful for spotting things you otherwise might miss. It’s like doubling your vision of the market. It really helped today and we caught every corner by using teamwork. I’ve always said that investing is a TEAM sport, there’s no reason to be a loner when it comes to trying to make money. So, we think it’s so cool that we’re talking about maybe opening up the conversation to people to view (for only a very small fee). If that interests you, drop me an email and let me know, it would be experimental to start and later we may make it a formal service and even invite certain experienced traders to contribute. Good communications are important to staying wealthy, as is communicating well with a lot of crewmembers while piloting a large aircraft. I have always said that flying the aircraft, for me, was the easy part, communicating well with everyone else was the hard part… Thank goodness the people on board that flight were okay, you never know what might happen, so let’s appreciate the time we have! You never know, you could lose it all in a New York minute. So, the DOW hit 8,000 and has bounced up 280 points all the way to being sizably green. That’s a good reversal and I caught it thanks to that ending diagonal pattern. Now the question is how far does this run? I don’t know, but it’s possible that it ends anytime… today, Opex tomorrow, Obama’s inauguration, who knows besides the insiders at GS and JPM? Rumor being floated now is that Citi (C) will be nationalized? Now they’re talking about Bank of America getting TARP money (our money) and .gov guarantees to help BAC purchase portions of C. What a bunch of fools in the government, and I will say the same thing about those buying their stock for any play meant to be longer than just a short pop. The fools rush in. 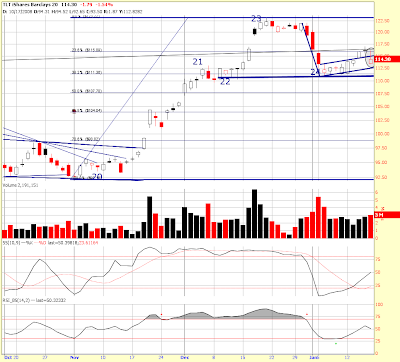 NOW we’re down from the top, XLF is looking terrible, C is down another 20%. 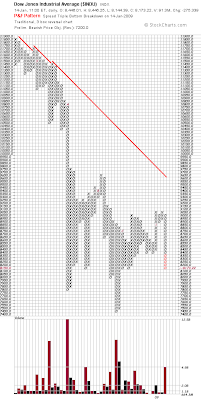 Below is the current DOW candlestick. Very much a doji that basically just got us back above the lower Bollinger. Reversal would be a lot more convincing with a hammer here instead. I’ll be going out mostly flat to slightly long, just because I don’t want to get caught on the wrong side of whatever they have in store for Opex tomorrow. I exited short positions and went long for a very short term play… Options expiration is tomorrow, fun and games. The question will be; is this the beginning of wave 2 of 5 down, or is it the beginning of ‘c’ of wave ‘B’? 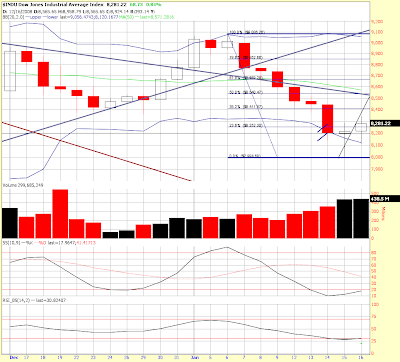 Below is a 5 day, 5 minute chart. The red lines are showing what looks like a classic ending diagonal. We could still reach the 800 area, but a break above the upper line and I’ll exit my short positions. I expect that although my math says 800, that it can likely turn a little before then, so I’m wary here and will exit in the 805 to 807 range if we make it there, OR will exit shorts on a break above that red trendline. I may try a short term long play for tomorrow, then nothing but time over the long holiday weekend. Yesterday’s bear flag broke down and it was worth about 38 handles from the break of the flag which happened just above 840. If you subtract 38 from 840, you wind up just above 800. This morning we descended down to 820 which is relatively strong support and we COULD bounce higher from here, but look at the math on this smaller flag that is forming. 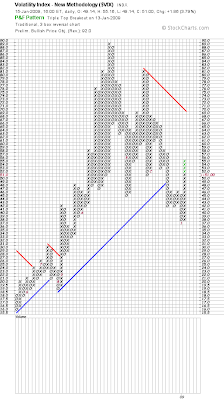 The top of the last leg down began at 850 and descended to 820 or about 30 points. 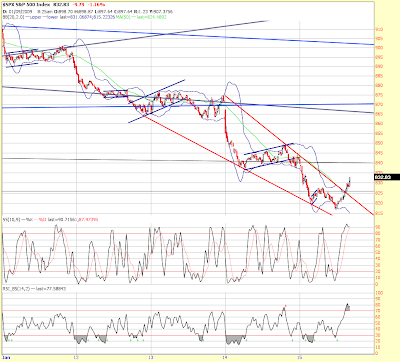 If this flag climbs up to about 830 and then breaks lower it, too, will be targeting the 800 area. It’s funny how the math works. Flags tend to develop at Fibonacci percentage points, in this case 50%. These Fibonacci relationships are found throughout nature and throughout the markets. 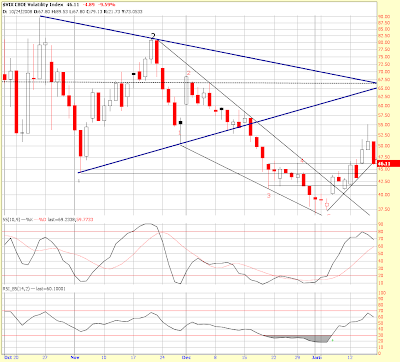 The VIX is up very strongly again, rising 10% up to the mid 50 level. Volatility and Fear is returning. 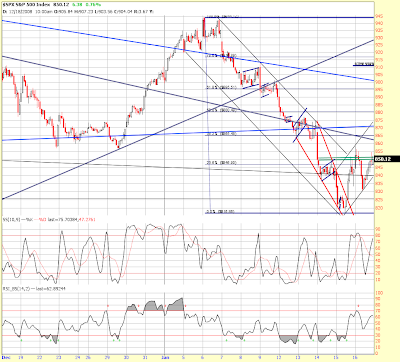 Caution is still advised… the best place to get short this move will be on a wave 2 retrace if this is wave one. Wave 2’s tend to retrace a large portion of wave 1, so that might offer a better short entry opportunity when it occurs – and it will. Cohn Gets Grilled by Grayson… Someone is finally asking the right questions! This is one of the first times I’ve seen Congress ask the right questions. Congressman Grayson is getting away from the trees and starting to look at the forest. The roots will come later, that’s when we’ll be talking about the role of the Central Bank and our monetary system. The Philly Fed's general business conditions index pulled up somewhat to minus 32.9 from minus 39.3 in November. But contraction has been significant as this index has been at very negative levels for three months. New orders point to further weakness ahead as this index came in at minus 25.2. The unfilled orders index also remained significantly negative. Price pressures eased further as the prices paid index fell to minus 33.2 from minus 30.7 in November. Also, prices received dropped sharply to minus 37.8 from minus 15.5 the month before. Futures were down last night but have come up this morning to about flat. Why? I guess JPM losing “only” $2.9 billion with earnings down 76% is good news – worse was feared! LOL, the truth is that JPMorgan is the most highly leveraged institution on the planet and if they were forced to mark all their “assets” to market today wouldn’t be worth spit. They are the lynchpin to the world of derivatives and they are being allowed the freedom to manipulate their accounting, to exchange their bad loans for cash, to have the taxpayers back their buying of other worthless companies, and to hide and obscure the value of their assets BECAUSE when, not if, the house of Morgan falls, the entire shadow banking system goes down with it. Oh, and they are the FED, in concert with the other central banks. Speaking of central banks, Trichet’s hand was forced over at the ECB forcing him to cut interest rates by another .5% and thus Euroland rates now stand at 2%. And speaking of bank shenanigans, Morgan Stanley is said to be looking for more oil tankers. No, not to move the oil that the speculate with, but to store it. What is the point of having investment banks own more above ground oil than oil companies? Is that necessary or make the system of delivery more efficient? Didn’t think so… it’s just another symptom of a money system gone wild. The Producer Price Index fell by 1.9%, the first drop in seven years. Again, more evidence of deflation, but remember that none of the government inflation numbers represent reality, they are complete hedonistic fantasy. And finally, an economic indicator that is growing… Ahh, the New York Manufacturing Index ROSE from a NEGATIVE 27.9 to a NEGATIVE 22.2, showing that the contraction in manufacturing is still ongoing, but it’s growing? 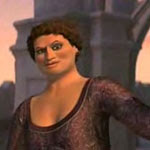 – ha. The Philly Fed survey comes out later this morning. Jobless claims for the past week jumped from 470,000 to 540,000, another very negative print. Continuing claims actually fell a little but are still extremely elevated at about 4.5 million. Steve Jobs won’t talk about his health, but everything’s fine, just fine, keep on buying the stock while he doesn’t disclose his health condition, everything’s fine. I mentioned a couple weeks ago that owning AAPL shares was like gambling on Jobs’ health, and if you were one of those gamblers, you just lost your bet. Now this morning we find out that doctors may have to remove his pancreas leaving him without the ability to produce insulin. Everything’s fine, just fine. From a technical perspective, not a lot to say other than an emphasis on the fact that volume is expanding again now that the market has been going down. 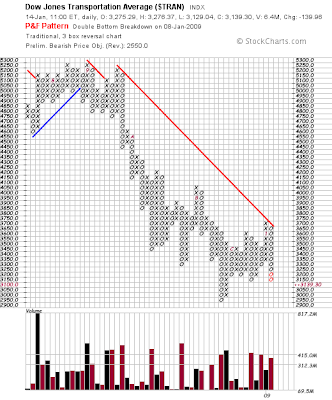 We’re oversold on almost all time frames up to the daily charts, and I’m sure that JPM fooling its stock holders for another quarter will lift the spirits among those who want a piece of the “super bargains” available in the financial space. 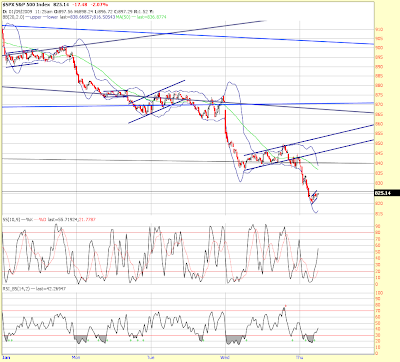 I note that the long bond has come back down some this morning but has not made it back into its channel. HOG continues to get slaughtered and is now sitting at about $13 a share, down from $20 just a few days ago. We still have a potential bearish flag on the table, but since it didn’t break last night I’m beginning to wonder if this move is close to over. This latest downtrend is most likely either wave ‘b’ of the larger wave ‘B’, or it is the beginning of wave 5 down, probably wave 1 of 5. If that is true, the place to get short is near the top of wave 2 which may be coming soon as we have short term oversold conditions and I can count 5 subwaves down inside this last move. 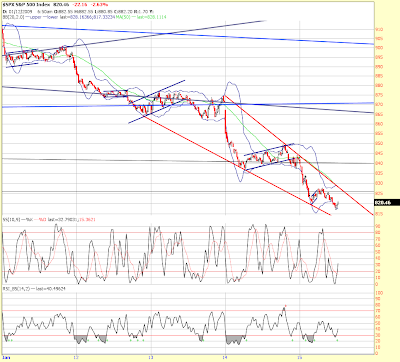 For now the 840 area has to remain resistance for the selling to continue. The next support area after that is in the 820 range, and after that we’d be looking at 800 which is a round number and has two Fibonacci coincident with that level. The November lows then beckon all the way down at 740. Don’t think we’ll make it all the way down there without bouncing first, so be patient and pick a good entry. Also be careful because if this is wave ‘b’ of ‘B’, we’re close to getting wave ‘c’ – doesn’t “feel” that way to me after yesterday’s action, but it’s still a good possibility. What’s left to keep the fantasy going at this point? More stimulus? Lower rates? Printing? Uh, huh, that’s what I thought. What happened to the Santa rally? The Obama inauguration rally? The fantasy is dying. Sadly, the last piece of news is that Ricardo Montalban has passed. He was great in his bad guy roles in the Star Trek movies, but I never understood how someone would pay $50,000 for a trip to Fantasy Island? I mean that was what, 1978? A dollar was still worth something then… it was only seven years removed from Nixon yanking the gold standard. Perhaps that was my early bubble economy radar at work?! Hmmm… well, I doubt Meredith has made it to my level of bearishness yet, but she’s catching on, step by step, downgrade by downgrade. Weak financials and REITS led the market down again; on the day the DOW gave up 248 points, the S&P lost just under 3%, the NDX lost 3.3%, and the RUT led the indices down with a -4.4% showing. 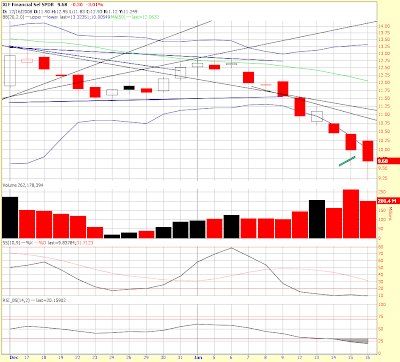 Notably the XLF lost 5.8% and IYR 5.2%, and the VIX gained 13.5%. Yesterday I mentioned that I thought we probably had a small movement on the McClelland oscillator… well we did, and today obviously fulfilled that. The market was down broadly with internals very negative, nearly 9 to 1 on the NYSE with preliminary data. That’s what I call cliff diving and is an ominous sign. 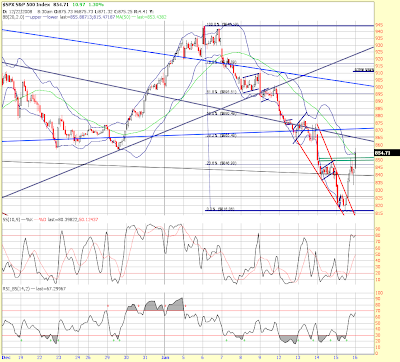 The bond market never did get back into its channel, thus I now think I was probably early with that call. I got out like I said I would, and will look for signs that it’s topping again. I was looking at the charts of the bond market during the Great Depression and noticed that it was about 18 months from the October 1929 crash that bonds turned. That same point for us would be in late March or so, but obviously every situation’s different as history does rhyme but seldom repeats. 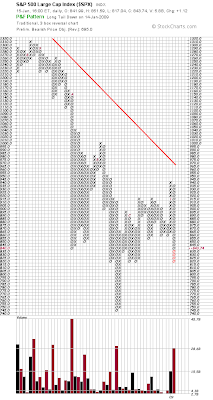 Regarding the indices, if you didn’t catch my post earlier with P&F chart breakdowns, I suggest you scroll down and look those over. 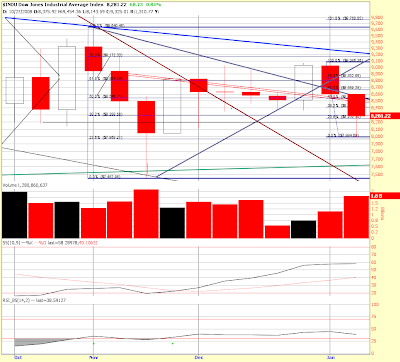 Next let’s glance at the SPX daily. Pretty much the same picture as the DOW. 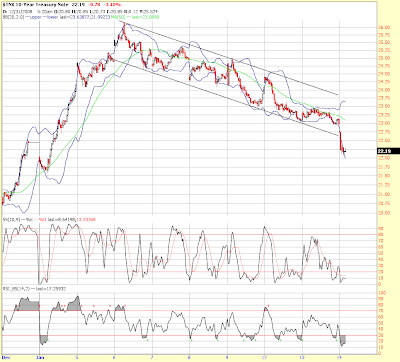 It did manage to close above 840, but is right on the bottom of the flag it spent the day building. 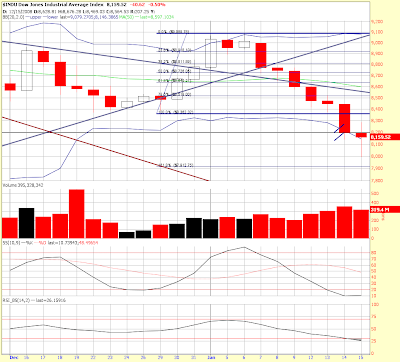 That flag has a target down around 800 if it breaks down. Next look at the Transports. They were nailed for another 4.8% today, again on higher volume. They broke beneath the prior December lows looking like they are going to retest the lower November lows. Yesterday some followers of DOW Theory were getting all excited about how the transports made a new low, but the DOW didn’t claiming it set up a possible DOW Theory non-confirmation. That was just wrong as I believe it would need to break the November low and then not have the Industrials join the party. Regardless, didn’t matter as the Industrials and the Transports are both still singing the same tune and DOW Theory is still on a bear market sell signal, I don’t see anything that will change that anytime soon. While we’re here, look at the slow stochastic… it’s pointing down pretty good and has a lot of room still. Options expiration is Friday… I’m still awaiting the usual fun and games. Overall this is a difficult point in the market to call, a lot of people are having trouble with it as it’s still in the same range, although now getting towards the bottom of the range. The 840 area is now key. If we break that, there’s a good chance we keep on trucking down for a while, but if we hold it, we could rally in the short term. Of course reality keeps interrupting the Sweet dreams, Steve Jobs just announced he’ll be taking leave through June causing Apple to plunge $10 in a matter of seconds after hours, and the /ES (S&P futures) just fell to 831, well below that 840 pivot. Tomorrow we have Jobless claims, PPI numbers, Empire State Manufacturing Index, and the Philly Fed Survey. 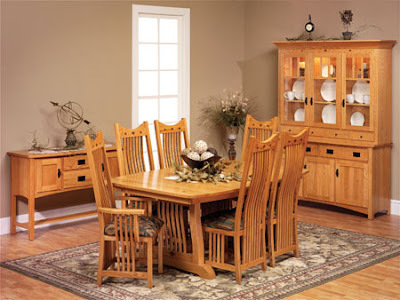 CPI and Consumer Sentiment come out on Friday. Or perhaps the bulls will continue to feel the rain again? Unless we move back up into it, the target on the latest flag is ugly. It’s worth about 38 handles, so it would target the 800 SPX area, and on the DOW it would target about 7,850. That’s a big if, we’re still oversold and have been oversold on the 60 minute timeframe for the past 4 days without a significant bounce. 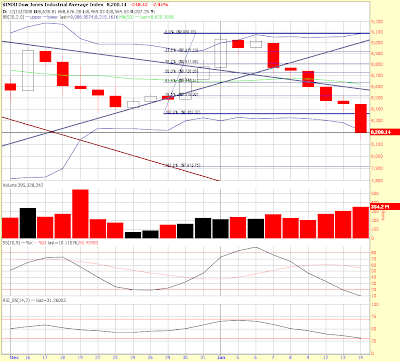 All the daily index charts ran into their lower Bollinger bands and are turning them lower. If you’re short and we regain the 840 area, I wouldn’t stick around as I also see what could be a very clean 5 waves down on the RUT. Difficult to trade unless you got short a while ago and held firm. Since I copied that chart, we’ve bounced back up to taste the flag bottom again… stay sharp and good luck. How bad? If the first quarter budget number is annualized, it’s $2 TRILLION bad this year. And that’s with non-GAAP accounting, AND without factoring in any more bailouts from Obama and his HOPE team – how likely is that? As I’ve been saying, the true deficit is going to run into the multi-trillions. There’s just BAD math all around us. Tax receipts are falling (that would be our nation’s income), while expenditures are going TO THE MOON – Alice! Cutting taxes and increasing spending is simply more bad math on top of already horrid math. WASHINGTON, Jan 13 (Reuters) - The United States racked up a record $485 billion deficit for the first three months of fiscal 2009, exceeding the $455 billion gap for all of the previous year, the U.S. Treasury said on Tuesday. In December, the government posted a deficit of $83.62 billion versus a year-ago surplus of $48.26 billion -- a wide swing that the Treasury attributed to a steep drop in corporate tax receipts and outlays from its financial rescue fund. … The combined October, November and December deficit was nearly five times the year-ago budget hole of $107 billion, according to Treasury data. The ballooning deficit could constrain President-elect Barack Obama's ability to revive the U.S. economy with a massive fiscal spending program this year. The deficit for fiscal 2009, which started Oct. 1, is expected to hit a staggering $1.186 trillion, according to the non-partisan Congressional Budget Office. This is even before an estimated $800 billion in proposed tax cuts and stimulus spending from Obama. ...While his theories get proven wrong. Which one is the Joker? 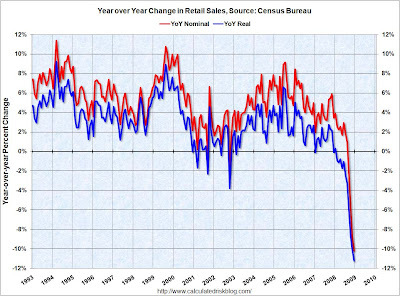 The market has deteriorated significantly. The DOW is currently off by 305 points, the XLF is down 5.6%, IYR is down 5%, the S&P is down 3.6%, and the RUT is down 4%. Futures are way down following the retail sales report for December, Nortel filing for Chapter 11, Deutsche Bank losing $6.3 billion in the fourth quarter, Greece’s credit rating cut by Standard & Poor’s, and Obama running into resistance from Congress… you know, the usual news as of late! Due to all that, the DOW futures are down nearly 200 points, and S&P futures are off by 20. So, the fundamentals are what I’ve been saying they are, and not what the “experts” were HOPING. It’s a bummer when expectations get dashed, that’s called disappointment. The Five Stages of Stock Market Realization (or death) – as explained by a giraffe! Since I missed the short entry at SPX 856, I am now resigned to waiting for either a retest of that level, or a break of the next major support level at 840ish. 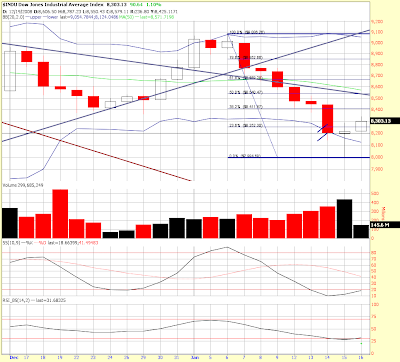 At that level, there is a pivot point in play and that’s also where the bottom of the daily Bollinger currently is. Overall, this is a dangerous place for traders. 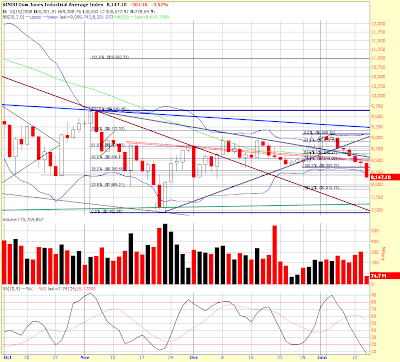 It could be a bear trap, but that’s NOT what the fundamentals are saying to me. So, we’re close to breaking down out of the range we’ve been in, but close does not count. Breaking 840 will probably set up a retest of the November lows, now that I will be a part of. Have a good day, I hope you’re not feeling like that giraffe! Jan. 14 (Bloomberg) -- Nortel Networks Corp., North America’s biggest maker of telephone equipment, filed for bankruptcy protection in a U.S. bankruptcy court. Nortel, based in Toronto, had more than $1 billion in assets and debt, according to today’s Chapter 11 filing of its U.S. subsidiary in Wilmington, Delaware. Nortel has lost almost $7 billion since Chief Executive Officer Mike Zafirovski took over in 2005, leaving him struggling for the funds to operate the company. Bank of New York Mellon was listed as Nortel’s largest unsecured creditor in its role as trustee on more than $3.8 billion in notes. As of Sept. 30, Nortel’s debt amounted to $6.3 billion, including adjustments for operating leases, pension deficits and other items. The company has $1 billion in bonds that come due in 2011. Total liabilities amounted to almost $12 billion. Zafirovski had sought to revive Nortel’s fortunes by cleaning up the balance sheet and reducing the workforce by 18 percent since he started. Demand for Nortel’s gear, mainly based on older code division multiple access technology, has waned as customers move to faster systems. Money markets in the U.S. seized up following the Sept. 15 failure of the securities firm Lehman Brothers Holdings Inc. Banks stopped lending as they hoarded cash, pushing the country into a deeper recession. That’s making it more difficult, and more expensive, for companies like Nortel to find new financing. The company could sell the CDMA unit to raise money, RBC analyst Mark Sue said in a report in November. The challenge is that too many asset sales may conflict with Nortel’s debt covenants, said Sue, who cut his target on the stock price to $0.